I've been super into mysteries lately. I've always loved Sherlock Holmes. I read all the stories when I was about fourteen and then read them all again in 2012 and into 2013. After I was done I had the most ridiculous craving for old Brit Lit so I went over to Jane Eyre (on the recommendation of my now Trek-addicted sister) followed by Pride and Prejudice then Bleak House and A Christmas Carol and then took up Wuthering Heights in January. When that was over... I don't know what made me do it... but I bought Murder on the Orient Express. Then And Then There Were None. Suddenly, I found myself completely caught up in Agatha Christie. 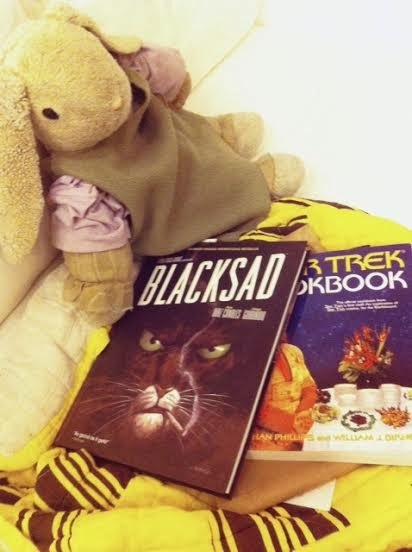 I can't get enough of these old mysteries and, while picking up some comics a couple weeks ago, I noticed Blacksad. Come on. 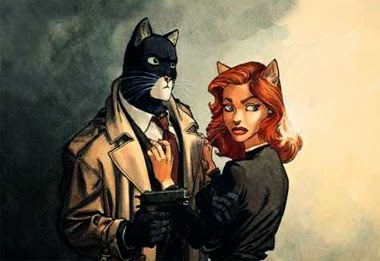 A French noir (written by Spanish dudes) mystery comic where the protagonist is a trench coat wearing kitty-cat who smokes and swears and gets in fist fights? I'm about halfway through this thing right now and I'm loving it. I have like, no time to read now. Aside from regular life stuff, I'm working my way through the edit of my second novel, Silver Tongue, and trying to finish the outline of the next book in the Awesome Jones trilogy. Hardboiled cats getting in boozed-up alley-way scraps with lizard guys is just not a thing that I can make a ton of time for... but I want to. Because it is awesome. Still, I was working and reading in the living room yesterday. Walked out to find a snack and came back and happened to get a new look at my little corner of the sofa. I laughed out loud and thought, "This is awesome." See the other book there? That's the Star Trek Cookbook by Neelix/Ethan Philips. It's full of amazing (Earth-friendly) recipes for your favorite Trek foods. Sisko's Shrimp Creole with Mandalay Sauce, Cat Food Subroutine #219, Prune Juice Cocktail and Klingon Bloodwine. I can't wait to make this stuff. It pushes me a step closer to being excited about Star Trek again. And, you know where it came from? A reader. She read my post about being burned out on my favorite show and my recent baking compulsion, connected the dots, emailed me and said, "Hey, I've got this book..."
I got it in the mail a couple days later and I'm so, so, so grateful to her. Thanks to her and to all of you for being thoughtful and insightful readers and for sticking with me even though I've not been able to stick with Trek. I'm sorry about not writing about Trek right now but cat detectives aren't so bad, right? Hopefully soon I'll have a post with pictures of my success/failure with Plomeek Soup à la Neelix!